When creating your page layouts it is very important to understand trim as a standard part of printing, and how to account for that trim. Properly placed pages will let your beautiful work shine! Whip your work into tip-top shape! Books are considered either Standard or Mini. Standard books are sizes above 6x9, while Mini books are anything below that. While hard and softcovers are both awesome, each has their own crop and bleed requirements. Keep this in mind when designing! All vital content (i.e. marriage proposals) should be kept within the crop guides with all non-vital content fully extended to the edge of the page. Our crop guides make sure your vital content is safe by showing you where the trim will fall. When you ignore them, it makes your content sad (and disappear). For bulk orders or important projects, we highly recommend ordering a proof so you can review the full book before continuing with the remaining order. It's always better to be safe than sorry! If you're unsure about something or just want a second set of eyes, email us or hop on live chat. We're happy to help! Heed this warning from Hamlet: while your book has only 1/8” guaranteed to be trimmed, the additional 1/8” is included for trim that may occur due to shifting during production (1/8”+1/8” = .25”). Because of this, we can’t guarantee any content falling within the Red Crop Guide (.25”) TO BE or NOT TO BE trimmed. Imagine Hamlet's skull friend - you want him all the way in the red and pink lines or he’ll start angrily waxing poetic. And believe us, no one wants waxy poetry. Sometimes your photos need a little more showcasing! If you want a continuous image to cross two pages, you don't need to make your image larger. Simply overlap 1/4" in the page gutter of each image for a pleasing, seamless result. Also, make sure that your spreads begin on an even numbered page (IE a spread going across page 2 & 3). Because our pages begin on the right hand side, if the spreads begin on an odd numbered page, then they be split up incorrectly! Usually it's as easy as adding a blank page to start, but check out this screenshot for a visual explanation. With the help of a fabulous wedding photographer and member, Edna Licia Henriquez, you can see a quick overview below for making two-page spreads. We also have examples of two-page spreads here, thanks to the members that kindly passed on their knowledge! One more VIPI (very important piece of information): Be sure that spreads are separated and not uploaded as one continuous spread since this will skew the size of the book and we would not be able to print your book. This means that you need to have individual pages, not spreads, being uploaded. During export just make sure that it will be saved out with all of the pages separated. You can certainly have 2 page spreads, just make sure that they are indeed two separate pages! Please note: if an order is placed with the interior uploaded as two page spreads we will have to cancel the order. But don't lose hope! You can edit the file, upload it to the site, and place a new order. When a book is created with spreads instead of separate pages, the new file would roughly double your page count and also increase the price of the book, which is why a new order would be needed. If you're ever unsure about something, send us a quick note and we can double check before you place the order! The look of elements placed on your page is ultimately your aesthetic preference. Design for print encourages elements not to fall directly against the edge of the page - the eye tends to like a little room around the edges for the most part. Because of this, when designing it is beneficial to visualize where the trim will occur. An additional buffer will also help to keep all vital elements from butting up against or under that trim. In the design world the technical term for this is "trying to dig out of prison". Now that we've covered the basics, below is a quick 1-2 (no punches, please) on setting up your document to preserve your vital content. Book Designer: It's a piece of cake to check on your vital content when using the Book Designer to create! Simply review the pages to make sure that your vital elements are not pushed directly up against or under the crop guides. You can see this both in the design process and when checking out by clicking "Layout Preview". 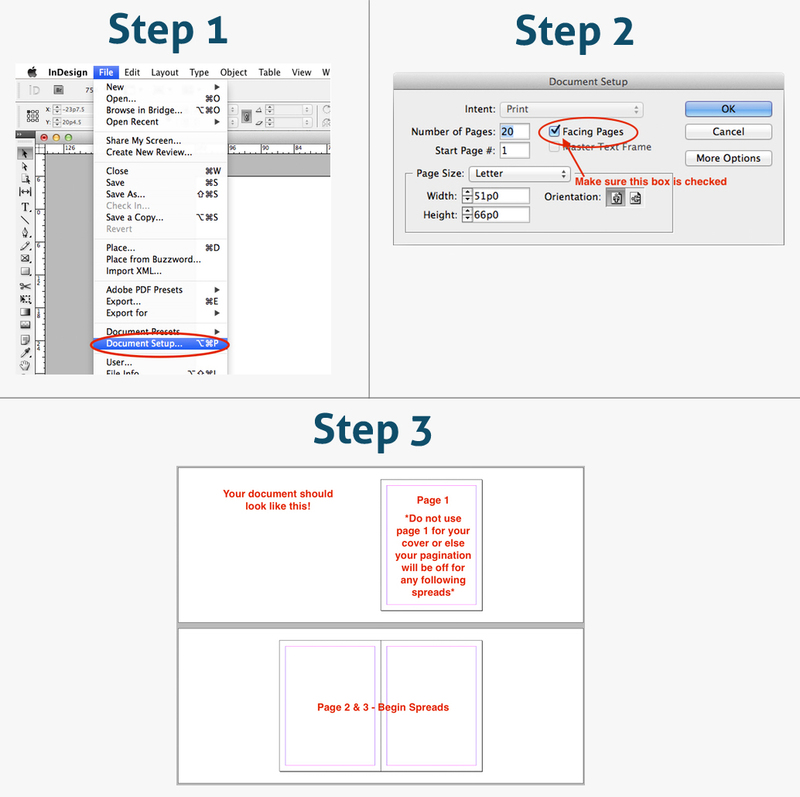 PDF: When designing a PDF you can set up a double guide on the pages. Size the document with an additional .25" above what size you want (IE: 9x7 would be sized at 9.25x7.25) to allow amount for the trim area. Set a .25" guide in from each edge and add another guide of .25", or whatever amount you choose, in from the first guide. Extend all non-vital content to the edge of the page to ensure there won't be an unwanted border if the trim is closer to 1/8". Then, make sure the vital content is fully within the guides to ensure they won't be trimmed if the trim ends up closer to .25". Please note: While this is completely subjective, when applied it always yields ideal results! How can I preview my project? You have a few different options when previewing, but we super duper recommend using the "Layout" preview. This preview shows the most accurate view of what your book will look like after printing when using the crop guides. You can find this on Step 3 of the PDF Uploader or after clicking "Buy Now" in the Book Designer. The button "Layout" will show under the front cover preview. Have any tips if I'm creating a PDF? Golly, do we ever! We have a great page that includes all of our biggest tips for PDF creation. We also have a top-notch help page on creating in InDesign, Acrobat, and Photoshop. We not only have words, we also have some pretty helpful infographics. That’s right, photo illustrations. Our recommended PDF creation software is Adobe Acrobat, Photoshop, or InDesign, as those programs are the most optimized for use in creating PDFs that are compatible for printing. Adobe offers a free PDF creator that allows you to create 5 free PDFs; we recommend your file be in its final form before you use one of the 5 conversions. You can find even more options at our PDF Creation Software page! What size should I make my project? You can see that with each of these sizes we added the additional .25" above the size we want. Within this .25" you'll want non-vital content extending to the edge of the page with all vital content safely within the caution area. This will lead to beautiful results! Don't forget: mini books have a much more aggressive trim due to their small size, so any book smaller than 6x9 will need to have an additional .25" caution area when designing. How do I add bleed to my layouts? All intended bleeding elements must extend beyond the document size by at least 1/4" total in all directions (1/8" on each side) but do not include any important elements such as text or faces. Do you have any guides to help design my cover? I wanted X ratio book and I only see Y ratio options. What gives? Uh oh, sounds like you selected the wrong ratio in the Designer or created your PDF in a different ratio than what you wanted. In this case you’ll need to go back to the drawing board (or PDF creation program) and change the size or ratio to fit what you want. If you have questions about what size or ratio you’ll need to make your project you can always email us or hop on Live Chat! Can you explain some of your terms a little more? Bleed: The bleed is the part on the side of a document that gives the printer a small amount of space to account for trim or movement of the paper. Bulk Order: an order of multiple books, typically 5 or more. Crop Guide: A Red/Light Pink/or Yellow guide located at the Previews, and the Designer. This colored guide is laid over the edges of the page in order to give you a visual reference of the caution area. Layout Preview: The preview of the Layout of your project available at Step 3 / Webstore Options page. This preview shows the most accurate view of the crop guides in relation to your project. Manufacturing: Physically printing and binding the book, calendar, or card. Production of the projects. These times precede shipping. Mini Book: Books sized smaller than 6x9. Standard Size Book: Books sized 6x9 or larger. Is an 8.5 X 8.5 book considered a Standard book or a Mini book? Thank you! I want to make a 5.25 x 3.5 minibook and just want to make sure i'm getting set up correctly. Your cropping and bleed guidelines for minibooks on this page says that as much as 1/2" could be cropped from each side. Does that mean that i should set up my pages with an additional inch in both dimensions (6.25 x 4.5)? For a 5.25x3.5 you can create the page ideally at 5.5x3.75! Then from there you will simply need to make sure that all the backgrounds are extended to the edge of the very edge of the 5.5x3.75 page - and that all vital content is kept within 1/2 inch from that outside edge. I have just uploaded my new pdf book for 11x8.5 hard cover printing. The images were created using the 1/8" crop guides. However, preview shows that some elements (all located within the 1/8" guides) will be trimmed. All non-vital/background content should be extended to the edge of each page. All vital content (text and faces) should be kept within the Red Crop-guide for all standard size books. The Pink Crop-guide is for mini-books (any book smaller than a 6x9) is more aggressive due to the the mini-books small size, and therefore requires a more aggressive crop-guide. Ive printed some books from a few different photo book companies and I noticed most companies have a white inner lining but yours has a black one (right when you open the book and at the very end), is there any way to change this colour? I was about to print my iPhoto book when I learned of viovio. So I followed the directions to save it as a PDF and viola! it worked. However, going through the preview process I noticed that the full bleed allowed in iPhoto doesn't fly on viovio's trim guidelines and important pieces like faces are cropped out. Is there any way to fix this without going back to iPhoto and redesigning the whole book?